1. An engraved pencil set for when your quill and ink duo aren't readily available. Standardized testing + these writing utensils = almost FUN!? Get a set of seven from Define Design 11 on Amazon Handmade for $12 (originally $15). 2. A ceramic mug capable of delivering messages for ya. Email? Overrated. Owls are so much more reliable. 3. Figurines of Hermione, Harry, and Ron being studious in the best class — HERBOLOGY. Just be sure to wear earmuffs whilst handling them! Those mandrakes have some loud lungs in 'em. Get them from Amazon for $9.23 (Harry), $8.25 (Ron), and $7.67 (Hermione). 4. An enamel pin perfect for the bibliophiles of your friend group. You know, the pals most likely to break into the restricted section of the library. Get it from Amazon for $10 (available in 15 styles). 5. Harry Potter: A History of Magic, a book filled with original drawings and drafts by J.K. Rowling. Think you knew everything about the wizarding world? THINK AGAIN! I wonder how many of you are thinking "AnaMaria, I know effing everything" right now. 6. A 100% cotton tee with the kind of mantra that I would consider having tattooed on my forehead. In a bright color and bold font. Happily. Get it from Amazon for $21.95+ (available in sizes XS-3X and in nine colors). 7. Handmade stickers inspired by the lovely Luna Lovegood, my FAVORITE Ravenclaw classmate. A free issue of The Quibbler, anyone? This pack also comes with a thank you card and a few extra stickers. Your planner? It will never look plain again, thanks to these gorgeous things. Get a pack of five from Santa Matita on Etsy for $8.19. 8. Felt-backed, water-resistant handmade coasters that stand a chance at actually protecting that Ikea coffee table of yours. These are so perfect, guests will actually want to use them. Hate the quote used on the coasters pictured above? 1) WHAT IS WRONG WITH YOU, and 2) No worries! 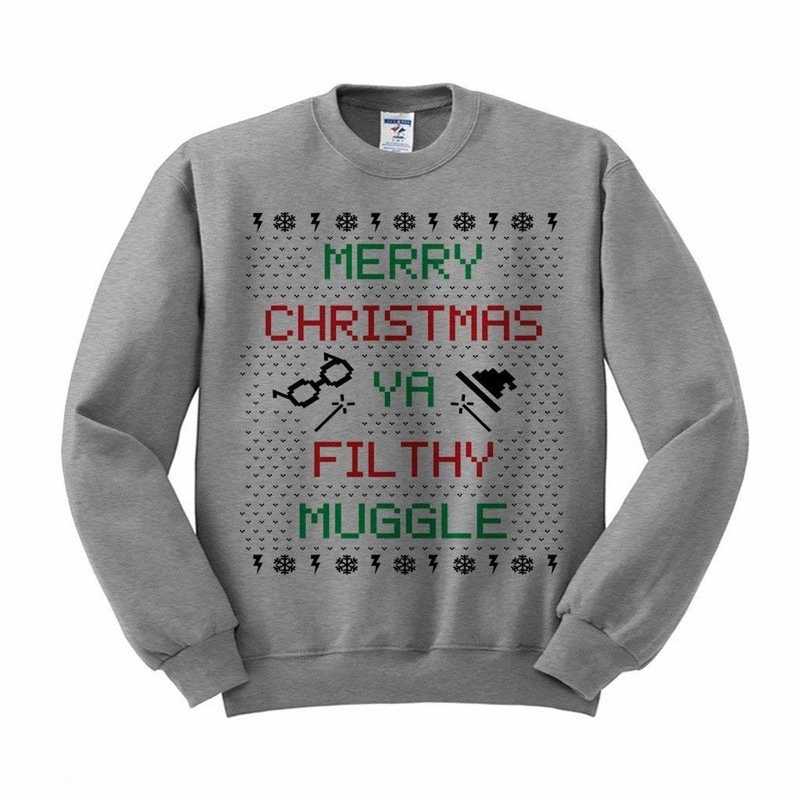 You can customize your set with a choice of 22 other Harry Potter quotes. Get a set of four from Arcadia Home Creations on Etsy for $10.57. 9. A Marauder's Map heat-changing mug that lets you roam Hogwarts after curfew without getting caught. Caffeine + magic = my definition of heaven. Ah crap, is that Snape? MISCHIEF MANAGED! Get it from Amazon for $19.99 (available in 11 styles). 11. A dolman top featuring the most BELOVED works of literature currently residing on your bookshelf. Get it from Amazon for $30 (available in sizes XS-XXXL and in 25 styles). 12. A handmade soy candle trio to fill any home with the delicious scent of smoked pine, vanilla/butterscotch, and mint/apple. Plus, these delicious candles come in an adorable box that is perfect for gifting. Just wrap it up and you'll be good to go! Or don't wrap it. Totally up to you. Psst, check out the Nook and Burrow Etsy shop if you'd prefer to buy the above candles individually (as opposed to buying all three of 'em in a set). Get it from Nook and Burrow on Etsy for $28.48. 13. A golden snitch bracelet that can be a bit of a nuisance. It's always trying to fly away! But it's so gorgeous, I truly believe it's worth the hassle. Get it from IpDipDoo on Etsy for $10.58. 14. 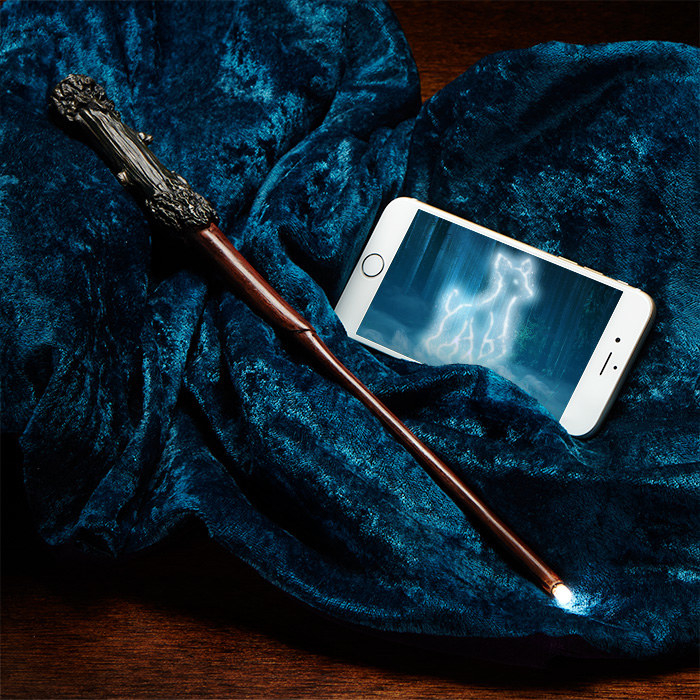 An LED light-up replica of Harry's wand you can pair with a connected iOS or Android app. The result? A video that looks like the "...and you're watching Disney Channel!" promos. This hand-painted, light-up wand is powered with LR44 button cell batteries (which are included) and will have you whipping up a Patronus in no time. 15. A toilet-proof passport wallet designed to ease travel between public lavatories and The Ministry of Magic. 16. A 100% cotton pillow cover that promises to protect you from the Bogeyman (AKA Dementors) whilst you sleep. Get it from PBteen for $39.50. 17. A crewneck sweatshirt so cozy, you'll probably continue wearing it even when the holidays are officially over and spring is on the horizon. 18. A magical, vacuum-insulated Thermos capable of keeping drinks cold for up to 12 hours. Plus, this comes with a pop-up straw and carry handle that makes it easy to use on-the-go. Get it from Pottery Barn Kids for $89. 20. Crew socks currently having a special promotion! All proceeds will be donated to S.P.E.W. (Society for the Promotion of Elfish Welfare). Get them from Amazon for $7.99 (available in thee colors). 21. A Marauder's Map replica you'll want to pack in your carry-on before boarding the Hogwarts Express, folks. Want to sneak off campus at any point? This piece of parchment paper is here to HELP. 22. A woven tapestry loved by Crookshanks and his cousin, pictured below. This awesome thing can be hung as a tapestry or used as a blanket or floor rug! This lovely thing is available in all four houses, as well as styles inspired by Hogwarts, the Marauder's Map, and the Tri-Wizard Tournament. Promising review: "We throw Harry Potter parties at our home and we bought all of the throws in this series to act as wall hanging tapestries. We could not be any happier! The colors are vibrate, and the quality AMAZING for the price. We also LOVE using them as blankets." —Steve B. Get it from Amazon for $20.97+ (available in eight styles). 23. A lined journal you can hypothetically store a horcrux in. Do I recommend it? Probably not. But it's your life! If you're looking to be the next Voldemort, have at it. Not a Gryffindor? No worries! This journal is available in all four houses. 24. A snowy owl plush because I don't think your school dormitory would allow for a real one. It's a cruel, cruel world us muggles are living in. 25. A wood sign that just made my credit card go ~swish and flick~. I've never added a piece of home decor to my shopping cart so quickly. Get it from Signed By K on Etsy for $16 (available in three styles). 26. A quill set that includes a feather dip pen, black ink, and a Hogwarts acceptance letter — because Google docs simply cannot compete with the feel of feather pen against paper, am I right? 27. A polyjuice potion flask known to completely alter your appearance and make you seem ~moody~. 28. A Deathly Hallows necklace featuring the Elder Wand, the invisibility cloak, and the resurrection stone. Want to read the story about the three brothers in full? Check out The Tales of Beedle the Bard. You know, Babbity Rabbity? Get it from Alex and Ani for $38 or from Amazon for $34.99 (available in two colors). 29. A transparent phone cover infused with a protection charm (in the form of a shock-absorbing bumper) to keep the glass on your iPhone from shattering after that 100th cement drop this week. Get it from Amazon for $7.19 (available for iPhone 7 and iPhone 8). 30. A magical cookbook that'll have you sipping on gin and [pumpkin] juice in no time. Hate pumpkin juice? FINE! This also contains recipes for treacle tarts, rock cakes, kippers, and more. 31. A portkey badge, magnet, or keyring because there is not a soul in the world who wouldn't choose to cut their commute time by 99%. Trains? Cars? No longer necessary when you've got this thing. Get it from Katie Abey Design on Etsy for $2.65 (available in a badge, magnet, or keyring). 32. A cooperative deck-building game in which four students — Ron, Hermione, Harry, and Neville — need to defend Hogwarts against evil forces. Players need to gain influence and power by collecting cards that hold spells, magical items, and strong characters. Promising review: "This is an AMAZING game. I loved it from the first time I played it, and have since introduced seven more people to it (some of whom have even bought it themselves since). It's easy to learn, easy to follow, and fun to play. I highly recommend it to any tabletop gamer who is even just a casual Harry Potter fan." —R.A. Get it from Amazon for $37.40 (originally $49.99). 33. A Horcrux bookmark collection that you should probably destroy. Or at the very least, you should turn it into the Ministry... seeing as how these can eliminate Voldemort once and for all. Get a set of seven from Amazon for $29.50 (originally $49.99). 34. Soft slippers best accessorized with some hot cocoa, a cozy blanket, and yet another Harry Potter marathon on Freeform (which will forever remain as ABC family in my heart). Get it from Amazon for $14.95 (available in sizes S-XL). 35. A battery-powered accent lamp to provide you with some light whilst you read out of Tales of Beedle the Bard. This accent light requires three AA batteries and is designed with foam feet, meaning it will stay put on whatever surface you put it on. Get it from ThinkGeek for $19.99 (originally $34.99). 36. High-rise leggings perfect for Quidditch practice, because you should feel comfortable + secure while flying hundreds of miles up in the air. Get them from BoxLunch for $31.12 (originally $38.90, available in sizes XS-2X). 37. A LEGO set featuring 878 pieces (cue nervous giggle) that you're very likely to step on while barefoot. But hey, at least you'll have built Hogwarts at the end of all that pain. This set also includes 10 figurines: Harry Potter, Ron Weasley, Hermione Granger, Draco Malfoy, Susan Bones, Professor McGonagall, Professor Quirrell/Lord Voldemort, Hagrid, Albus Dumbledore, and Nearly Headless Nick. PLUS! It includes a buildable Basilisk, Fawkes, Hedwig, and Scabbers. 38. Bertie Bott’s beans available in a wide array of delicious, not-at-all-disgusting flavors. Banana! Blueberry! Black Pepper! Booger! Get them from Amazon for$3.94. 39. A wish bracelet presented on a (glorious) card that your BFF will never want to throw away. Surprise! It'll actually turn into home decor to be displayed on their bedroom wall. Get it from Dezi Lou Design on Etsy for $4.50 (available in 18 colors). 40. An umbrella to let you show off your house pride even when it's pouring rain outside, because there is nothing — NOTHING, I TELL YA! — that can dampen your love for Hogwarts. 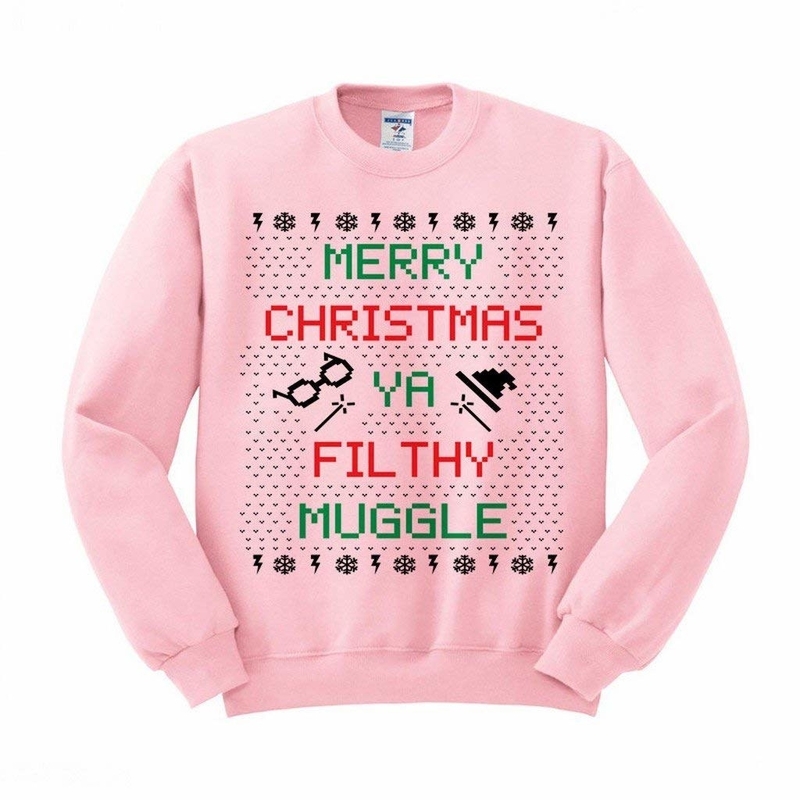 Get it from Amazon for $19.95 (available in Hufflepuff, Ravenclaw, and Slytherin). 41. Personalized stockings because what is better than waking up on Christmas morning and checking to see how much coal Santa dropped in your Harry Potter-inspired sock? Nothing. Get it from Pottery Barn Kids for $27 (originally $39.50, available in four styles).